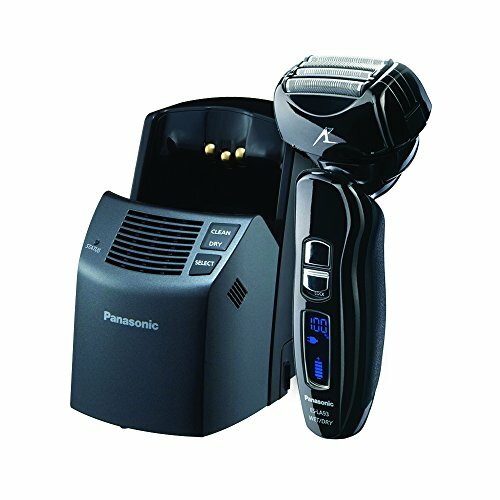 The Panasonic ES-LA93-K Arc4 electric shaver with Vortex Cleaning System, has been around for quite some time and it gained a reputation for being a highly efficient and effective electric shaver. with the recent price drop, this ES-LA93-K is an excellent value for your money. Why should you buy the Panasonic ES-LA93-K Arc4? Looking at its features you will definitely know that the ES-LA93-K Arc4 is a real bargain regarding performance and value for money. A pivoting head that can pivot in four directions – back and forth; left to right. The four-directional movement aids in following the contours of your face, especially the tricky areas like the chin and jawline. Also, you have the option of locking its head in one position, which can be useful when shaving precision areas, like just below your nose. 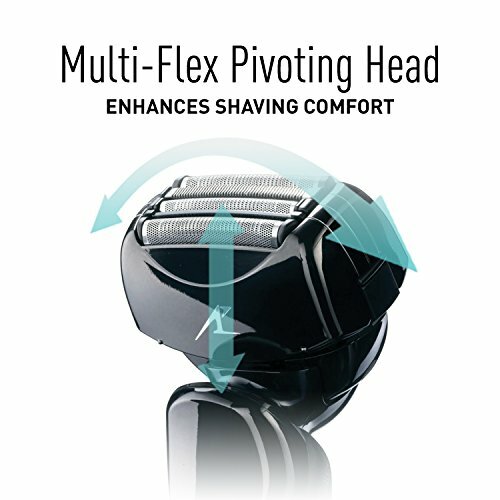 This Panasonic Shaver has 4 blade shaving system with an arched profile, hence its name Arc4. All the four blades can move independently. There are two main foils, one slit foil for long hairs and one finishing foil. To minimize irritation both the blades and foils are made up of hypo-allergenic stainless steel. Some of you might feel that the shaving head is a quite big because of its 4 blades but once you get used to it its size, you’ll have no issue shaving with it. With 14,000 CPM this electric razor from Panasonic is definitely a step ahead from its predecessors, which had 13,000 CPM motors. 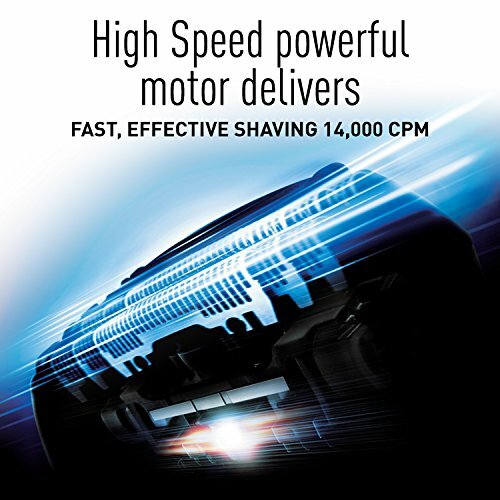 It is one of the most powerful motors that you can find in any electric shaver and gives you an edge when you need to be fast and when dealing with coarse hair. The Panasonic ES-LA93-K Arc4, has a second motor, located in its head. The sole purpose of this motor is to produce vibrations of the outer foil. This lifts the hair lying flat on the surface, making it easier for the blades to cut them. It also reduces the amount of pressure you need while shaving resulting in less irritation and no razor burns. The vortex cleaning system is an all in one cleaning and charging station. Cleaning with sonic vibrations, which helps in getting rid of the finer hairs that may get trapped inside the foils of the shaver. The costs of using a cleaning station are very low. Its cartridges are inexpensive. A single cartridge can last for 30 sessions of cleaning. Panasonic also has its own detergent for its shavers, which is quite similar to most alcohol-based cleaning stations but has certain proprietary blends that makes them more suitable to their products. This is a very convenient solution, and can help maintain high levels of hygiene, but does not come cheap, and is mainly aimed at users with high disposable incomes who can afford such things. As is the case with foil shavers, you can always clean it with warm tap water. You can simply apply some liquid hand soap and activate the cleaning mode. With two charging options – by using a cord or by docking it in the cleaning and charging station. With universal voltage function you can easily travel around with this electric shaver. It takes an hour to fully charge itself and gives a runtime of 45 minutes. All of which is displayed on its 10-stage blue-light LCD display, which is definitely an upgrade for those who’ve dealt with their shavers losing charge in-between the shave, resulting in an uneven and incomplete shave. Apart from battery indicator this LCD also tells you when you need to clean your shaver. Designed with ergonomics in mind, this electric shaver is sleek and easy to grip, even when it gets wet. It is very comfortable to hold even after a few minutes of shaving. It’s not too noisy or loud when compared to other electric shavers out there. With nano-blades placed at 30 degrees, this device gives you really close and clean shaves every time. Each blade is precision honed to ensure sharp and effective shave. You will never experience any sort of pulling or tugging mainly because of its very powerful motor and sharp blades. It is a perfect device for those who have in-grown hairs, as after a few shaves you will notice how the problem fades away. Also good for those with very sensitive skins as it is not one of those really aggressive electric shavers. 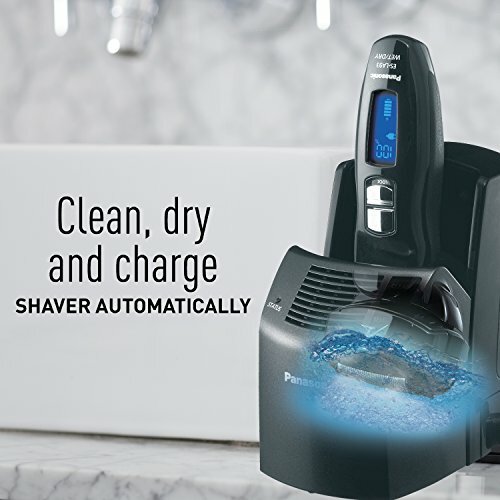 This machine comes with all the features that you demand in a min-to-high end electric shaver including an impressive cordless running time, really powerful motor, and an automatic clean and charge station. Considered to be a premium tier of Panasonic’s men’s shavers, this shaver will shorten time and give you that clean, smooth flawless look. A great device for those who had been using rotary shavers until now. You can easily do circular movements but gain the benefits of a foil shaver instead. Shaving in the morning has just become easier. It promises to give you clean smooth shave every time you use it.